This function block provides the ID of a language defined in the mask designer. The ID is accessed via the output LangID. All languages defined in the mask designer are listed in the parameter dialog. One entry can be selected in the list. The check box is used to switch between global and instanceable parameters. 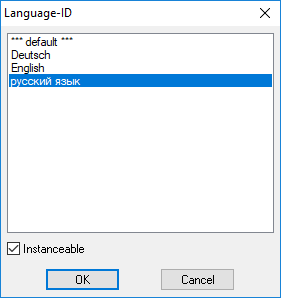 The name of the selected language is displayed in the function block. A yellowish background indicates a global parameter. The background is white at an instanceable parameter.